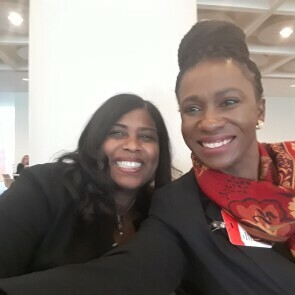 For two weeks, female executives mentored two rising star businesswomen as part of a program co-sponsored by the U.S. State Department. We sat down with the mentees and mentors to share just how transformative the experience was—for everyone. o thrive in the nonprofit world, you need a combination of talents: deep expertise, cutting-edge ideas, boldness and a lot of perseverance. But there's something else that's equally important for success: confidants and mentors. That’s why, since 2005, the Global Women’s Mentoring Partnership—sponsored by Fortune and the U.S. State Department, in conjunction with the Vital Voices Global Partnership—has paired businesswomen from around the world with top American female executives. 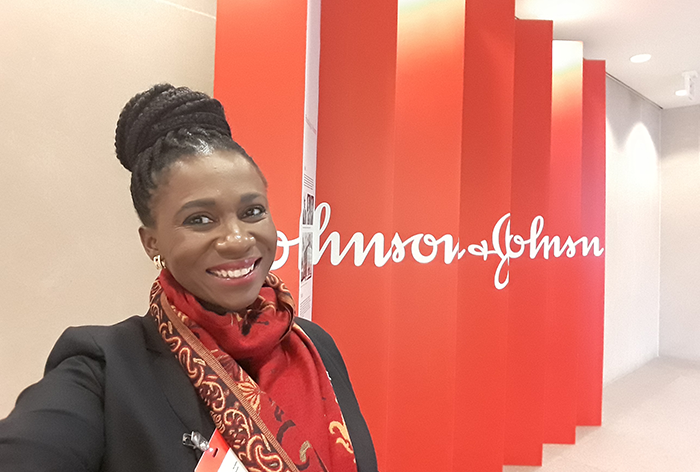 For the fourth year in a row, Johnson & Johnson had the opportunity to participate by hosting two rising social entrepreneurs from South Africa: Emma Dicks, CEO and co-founder of CodeSpace and director of Code for Cape Town, and Lerato Motsamai, founder and CEO of Petrolink and GIRLIGNITE Africa Academy. During their two-week visit, they shadowed Johnson & Johnson executives, attended town halls and participated in strategy sessions—all while receiving valuable guidance and insights they can take back to their companies, communities and even their own young mentees. Dicks and Motsamai are both passionate about helping support young women with the know-how to get jobs and build careers, so in honor of United Nations World Youth Skills Day—which highlights the need for education and training to help address unemployment—we asked the mentees to share how they're already making an impact in South Africa, thanks to their time spent at Johnson & Johnson. Several years after launching Petrolink, a South African manufacturer of high-grade automotive and industrial products, Motsamai wanted to do more for the community and founded GIRLIGNITE Africa Academy, a nonprofit that helps girls from low-income areas in Johannesburg improve their business, academic and life skills. Q: What’s your goal with the work you do? Lerato Motsamai: I run two organizations. At Petrolink, we’ve taken on a big project to formulate lubricants that are biodegradable. We hope to not only establish ourselves as an environmentally conscious company, but also be at the forefront of the industry in terms of high-tech solutions. With GIRLIGNITE, we want to empower girls to think of STEM2D (science, technology, engineering, math, manufacturing and design) as a viable and attainable career—not just a math class they have to pass in school. We try to create a fun environment that interests them, and also shows all the amazing ways they can become involved in STEM2D, whether it’s chemistry, robotics or building smartphone apps. Q: Did your mentoring experience at Johnson & Johnson give you fresh ideas for how you can push your organizations forward? LM: Yes, so many! Right now, we’re two separate entities, but during my time with Johnson & Johnson, I received ideas for how to marry the two. My mentors suggested that I open up GIRLIGNITE to my Petrolink employees and allow them to mentor these girls. It will not only incentivize employees to give back, but it will also give the young girls a chance to get real-world experience, and perhaps give them a greater appreciation of what I’m trying to steer them toward. Q: How did the experience shape you personally as a leader? LM: One very common recommendation from everyone I spoke with was to be comfortable asking for help. Being in a male-dominated environment that’s not very diverse, I’ve felt that, as a black woman, I've needed to prove myself. I felt afraid to expose my vulnerability and wanted to come across as strong. This program just reminded me that reaching out to people is not a display of weakness, and most of the time, you find that people are actually quite empathetic and helpful. I always encourage women to toot their own horns and mark their own wins because it not only boosts your confidence and acknowledges your efforts, it gives other women permission to say they deserve their wins, too. Q: How did your background and expertise help Lerato as a mentee? Beth McCombs Beth McCombs, Vice President, Research and Development, Ethicon: Putting together a strategy requires a lot of pieces: understanding market trends, needs and customer segmentation; building a portfolio strategy; and building the executional capabilities. When Lerato started Petrolink, she had tremendous knowledge of the industry, and since she is now leading her company through a significant expansion, she was eager to learn how a company like ours approaches strategy. 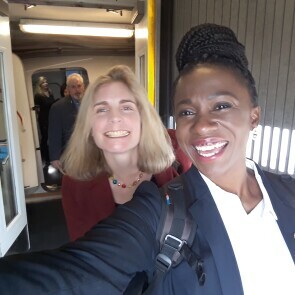 We spent a day together working on Ethicon’s future of surgery strategy, so she was immersed in conversations about how to develop one. I think the workshop helped show her the importance of having a diverse set of voices and expertise around the table. Q: Is there a story you shared with Lerato that you learned from your own mentor? Nikkia Miller-Blakes Nikkia Miller-Blakes, Vice President, Johnson & Johnson Technology: During our time together, Lerato would often pause and say, “I can’t believe I was chosen for this opportunity. I’m just so thankful.” And this resonated with me. I always knew the importance of gratitude, but one day, one of my mentors told me something I will never forget. She reminded me that I needed to acknowledge that I deserved the opportunities that came my way—whether it was an award, promotion or a big project. And to remember to say, “Well-done, Kia” to myself. I told Lerato to take time to recognize herself and her achievements in the moment because she worked hard to get there. I always encourage women to toot their own horns and mark their own wins because it not only boosts your confidence and acknowledges your efforts, it gives other women permission to say they deserve their wins, too. Q: What inspired you about Lerato? BM: She’s just an impressive, values-oriented person who really is driving ethical decisions in her business. It can sometimes be challenging to play the long game in business in terms of ethics and high quality, and leaders can be tempted to take shortcuts in pursuit of short-term gains. But Lerato takes that long-term, higher road, which also reflects our heritage and values at Johnson & Johnson. Q: What’s an insight that you wanted to share with Lerato? NMB: She had great questions lined up for our senior leaders regarding their leadership style, experiences and how they achieved career success. My advice to her was to also foster dialogue that allowed her to gain insights and guidance as it relates to her own business growth plan, long-term vision and extending her network. I wanted to let her know that it’s her time, too, and she deserves to make the most of it. Dicks launched her educational technology company CodeSpace in 2017 to promote creative digital solutions to social challenges by teaching coding skills to people who might not have easy access to that kind of training. In 2014, she also founded Code for Cape Town, a nonprofit dedicated to teaching coding to high school girls. Q: What’s your goal with your initiatives? Emma Dicks: My passion really lies in education and enabling young people to bring their ideas forward and participate in a meaningful way in South Africa’s economy. I’m really interested in diversifying—getting more women, people of color and people from broader socioeconomic classes equipped with the skills that companies are looking for, so they can start playing a greater role in our country. Q: How will your mentoring experience help you achieve that? ED: Getting more people into coding is primarily about building awareness of the fact that it’s a viable career. That is really a communications and marketing challenge—something that Johnson & Johnson understands. One thing I’ve already learned from the program is how to communicate our vision and mission more effectively and think about ways to garner support for what we’re trying to do. Q: How else has your time at Johnson & Johnson helped you become a better leader? ED: There are several things I can think of. The first is this program has really forced me to think about how I can amplify my voice and spread a message for positive social impact, which has been incredibly helpful. The second impact has been about how to effectively manage my various responsibilities. Leading a start-up requires balancing three main roles: producer, manager and executive. You’re attending to executive decisions for the organization, managing teams and also rolling up your sleeves and getting stuff done yourself. There’s a constant tension between these three roles and it requires discernment and discipline to balance them correctly. My mentor, Alma Scott, helped me optimize not only my various roles, but the roles of the three co-founders of CodeSpace, so we can achieve even more. A lot of American and European entrepreneurs start giving back once they’ve become successful, but I’ve found that, on the African continent, people strive to build their community while they’re building their business—and both women are fantastic examples of that. 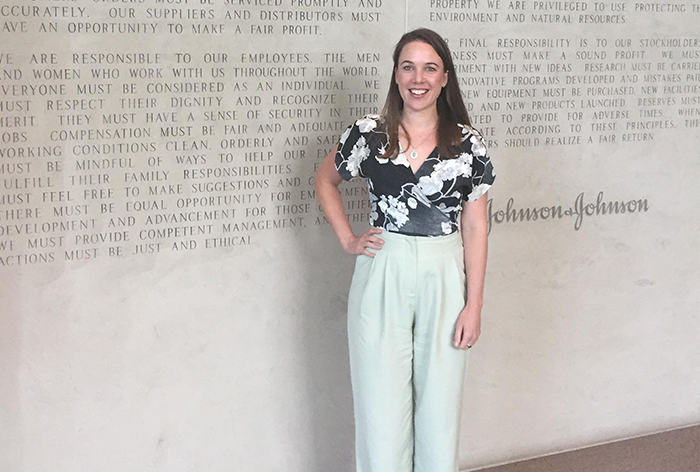 Her Mentors: Alma Scott, Vice President, Operations and Partnerships, Johnson & Johnson Global Public Health; and Vanessa Broadhurst, President, Cardiovascular and Metabolism, Janssen Pharmaceuticals, Inc.
Q: What did you most want to share with Emma? Vanessa Broadhurst Vanessa Broadhurst, President, Cardiovascular and Metabolism, Janssen Pharmaceuticals, Inc.: I really enjoy speaking with early-career women to find out what they are trying to do and what they are committed to, so I can help them navigate their success. Emma is a leader, so I gave her advice about how to have candid conversations with her team that really encourage people to work toward a common goal. The second important thing for Emma to keep in mind is leadership resiliency. Things don’t always go right when you are running a business, but the question is: What are you going to do tomorrow? A lot of success depends on your ability to dust yourself off from a setback and create the next plan. Q: What did you and Emma end up focusing on during your time together? Alma Scott Alma Scott, Vice President, Operations and Partnerships, Johnson & Johnson Global Public Health: Emma's start-up is still in its early stages, so we worked a lot on her governing structure, as well as organizational and role clarity. Because she’s part of a team of three partners, we discussed the best ways to make sure everyone’s responsibilities are spelled out. I also wanted to assure her that even though she’s part of a team, there’s nothing wrong with taking opportunities that might, at first, seem to benefit her the most. I always like to stress to my mentees that if a program or course pushes you to grow as an individual, take it. If it benefits you, then it will enable you to give back to your community, your organization and your family. Q: Why do you think Johnson & Johnson's global approach to mentoring women across continents is unique and impactful? VB: We truly believe that to be successful as a company, we need to give women all over the world opportunities to grow, develop and build successful businesses. This program is just one of the ways we support that. Q: What did you find inspirational? AS: What really moved me about Emma—and also Lerato—was the commitment to community. A lot of American and European entrepreneurs start giving back once they’ve become successful, but I’ve found that, on the African continent, people strive to build their community while they're building their business—and both women are fantastic examples of that. They spend a lot of time educating and engaging the community, and help set an example for others on how businesses should work. Learn how Johnson & Johnson is igniting the power of women to inspire the next generation of healthcare movers and shakers.